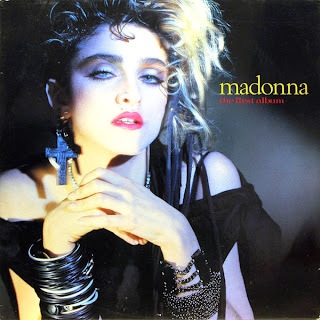 Madonna started the black rubber band craze that I wore in the 80's. For this generation, there are Silly Bandz. Whoever created them is rolling in the bucks. 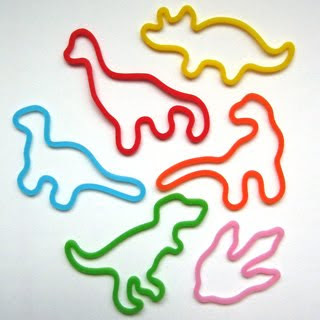 My son wears an armful of the dino-shaped ones everyday and exchanges shapes with other kids all the time. Yep, the beat goes on! I've heard so many good things about these silly bandz but never seen them so thanks for showing a picture! What a concept, I bet the kids do go wild for them!! I still have a few of the rubber bracelets, that's one of those things I enjoyed a bunch while growing up... now all of them have meanins but when Madonna started the craze the only words for them was must-have! The craziest thing about silly bands is that they have never once spent even a dollar on advertising and they are still selling like hot-cakes! We were just talking about this the other night! I said Madonna had an armful of black bracelets, in her Borderline days!! So funny. My kids wear the bracelets too. It's a fun little trend that's not really expensive, and it is sort of teaching them good sharing! yep - My kids wear them too!!! I was just thinking this morning, I thought I looked so cute going to work, but would I still think my outfit is cute ten years from now. I guess good fashion continues on to new generations! My students are obsessed with these and they're in high school! Just the other day, a friend of mine was telling me how all of the students at the middle school where he works wear an arm full of these. It got me thinking, imagine if you were an elementary or middle school teacher for like 30+ years. Imagine how many trends and fads you see first hand come and go. I remember slap bracelets! I rocked the heck out of those! Like 4, 5 at a time. Isn't it amazing what "takes off" in our society. I do love those bracelets. Remember Beanie Babies. I want to invent something that will make me money! Ha! so I see those shaped rubber bands all over, but I haven't bought any. Maybe I need to jump on the bandwagon lol. 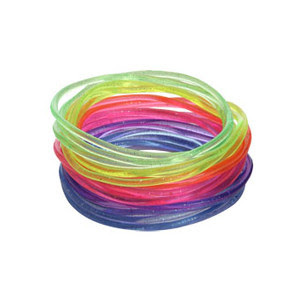 Also, I remember the slap bracelets--where it's a long strip you slap around your wrist. THOSE WERE COOL. The kids out here are not allowed to wear them at school, because people are getting hurt. Over bracelets? Really? Those silly bandz are all over our house! So funny how things get popular. i knew nothing of those bands! ive never seen them before!! They are wildly popular around here as well. My younger son's arm is filled with them! And I used to wear like 40 black rubber bracelets back in '85. Funny. We have about a million of those ridiculous things all over the house. Such a simple idea and someone is making a fortune. 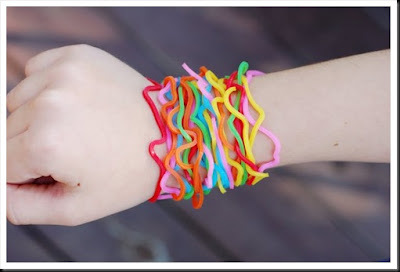 just got some silly bandz for my kids finally. I wish I would have thought of them. OMG, I was just saying the other day how I wish I had invented those! My nieces and nephews are obsessed with Silly Bandz! I wish I'd thought of this myself, lol. Those are awesome. I've never seen such a thing. But I did rock the black ones in the Madonna days! Animal-shaped bracelets. Who knew. I do remember those bracelets. I think I recently got rid of them. I succumbed to buying some of these last week for my boys. Thankfully, I found a bulk deal for cheap online. Of course, now they want more! Those are so cool. I have a set and they are a great new twist!